From Brooklyn, NYC, Matt & Kim are an indie-rock duo who make music to dance to, wake up to, party to, crank up and sweat to. 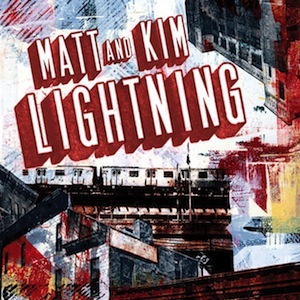 With a generous helping hand from electronica on their most recent release Lightning, Matt Johnson and Kim Schifino have crafted a well-rounded decade of songs that are unapologetically optimistic in tone and lyrical outlook. With titles including “It’s Alright,” “Not That Bad,” and “Now,” this indie-rock album is decidedly positive and uplifting, and all tracks are short but very sweet indeed. If Fun. and The Go! Team made babies, they might name them Matt & Kim. Opening track and leading single “Let’s Go” features marching band drums and a simple but effective keyboard riff. Vocals are anthemic and stirring, with lyrics such as “Shouting out of my windows, rolled down / ‘Cause I don’t care anymore.” Yes, it makes us feel good too! Happy, infectious, and unpretentious in its simplicity, Lightning is a breath of fresh sea air after a season in a smoggy, traffic-addled city.